Theravada is one of the three main branches of Buddhism. In Asia it is practiced widely in Thailand, Laos, Burma, Sri Lanka, and Cambodia. This fascinating ethnography opens a window onto two communities of Theravada Buddhists in contemporary America: one outside Philadelphia that is composed largely of Thai immigrants and one outside Boston that consists mainly of white converts. Wendy Cadge first provides a historical overview of Theravada Buddhism and considers its specific origins here in the United States. She then brings her findings to bear on issues of personal identity, immigration, cultural assimilation, and the nature of religion in everyday life. Her work is the first systematic comparison of the ways in which immigrant and convert Buddhists understand, practice, and adapt the Buddhist tradition in America. The men and women whom Cadge meets and observes speak directly to us in this work, both in their personal testimonials and as they meditate, pray, and practice Buddhism. 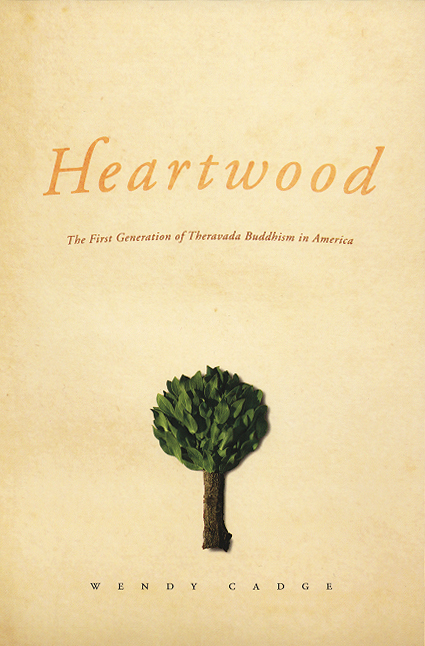 Creative and insightful, Heartwood will be of enormous value to sociologists of religion and anyone wishing to understand the rise of Buddhism in the Western world. "A heartening look at American Buddhist institutions whose basic viability seems secure. . . . Readers get a sympathetic yet realistic assessment of the substantial gains dharma has made in the U.S."
"Cadge’s methodology contributes to the kinds of questions and areas to explore when assessing the different types of Buddhists in North America. This book will appeal to scholars of North American-based Buddhism, and to sociologists interested in non-Christian religious organizxations in the United States, especially the transitions and transformations in religious identities."